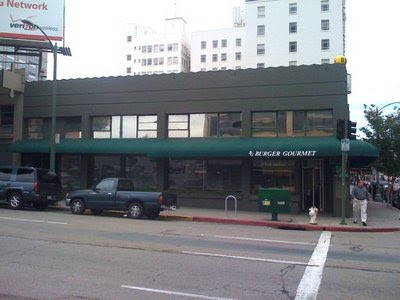 Burger Gourmet in Oakland, CA was a pleasant find one day when I found myself in downtown Oakland for an appointment. I typed “burger” into my iPhone and found the Gourmet was just a few blocks away. As I approached, I spotted their green awning and entered to find myself in a high-ceilinged room full of people enjoying their burgers. Handwritten on the board behind the counter were dozens of burger choices. I went with the basic Bacon Cheeseburger ($6.25) and Frings ($1.95); fries and Onions Rings for $1.95 constituting a hell of a bargain, which I applaud. The place is very green. Not in the earthly sense so overused in marketing, but green tabletops, green carpet and the aforementioned green awning. Everything was clean and orderly too. My 6-ounce burger came a little overcooked, but the rest of it was very nice. A sesame bun was toasted and nicely fit the burger. Bacon crunched atop the nicely melted cheese. The usual compliment of fresh veggies was all in attendance as well. Everything balanced properly with some nice spicing to the meat. Two big, battered onion rings perched on top of medium cut skinless fries, a tidy accompaniment to the burger. It was all quote lovely, next time I am downtown, I will stop by again and try one of the more adventuress burgers from the big board. 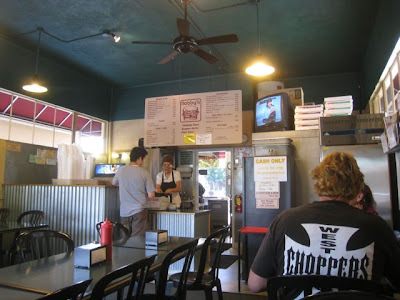 Nobby’s in Chico, CA impresses with a great burger in a clean unassuming setting. I found Nobby’s on a recent business trip to Chico. 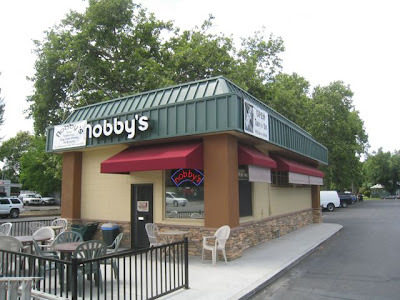 Before I went, I verified with a local that if there is one burger to have in Chico, it is Nobby’s. He did not mislead me. Nobby’s sits on a corner next to a strip center with a poker club. The cinderblock building is clean, clean and clean. Green paint and corrugated steel give it a more modern industrial look. The friendly lady at the counter took my order and recommended “the best tea in town”. Only one refill, but the cup was huge. 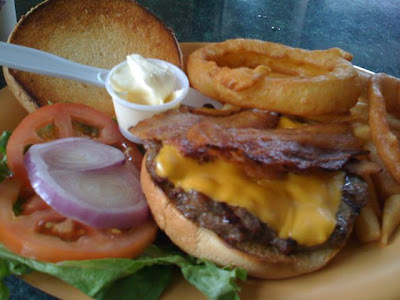 I also ordered the Nobby burger ($4.25) with cheese ($.95) and bacon ($1.35), fries ($1.75) and onion rings ($2.45). I took my seat at a green laminate table on a black plastic chair. It was still before noon on a Friday, but the people were starting to stream in. There are about 8 tables inside and more in front outside. The fries and rings came first. Fries were cut medium with the skins on. They were hot and a little too brown and nothing special. The onion rings were battered and thin, featuring more batter than onion for my taste. The feature though was the burger. A 1/3-pound, fresh ground patty was buried beneath an impressive shelf of cheese which was allowed to run outside the burger and get crisp on the griddle, giving it a chip-like texture on the edges. The white bun was spongy and lightly toasted. Tons of veggies accompanied the burger, tomato, lettuce, pickle chips and red onion. There was mayo as well. The whole concoction was excellent. The burger by itself was flavorful griddled instead of charcoal. As I finished up, I heard the lady at the counter say 30 minutes, to a call in order. Nobby’s was cranking up for the local burger lovers. Gordos Gourmet Hamburgers in Walnut Creek was a last second burger before an unexpected appointment in Walnut Creek. Everyone on Yelp seemed to like it, save a few curmudgeons, so I asked my buddy Mark to join me and giver them a taste. Gordos hides in the corner of a busy shopping center. Tables sit out front in the warm air of a June afternoon. Inside, the walls are hand painted in scenes from around town. The place feels old-school and comfortable. Behind the counter, the cook formed patties from fresh ground beef, sprinkling it with pepper and salt. 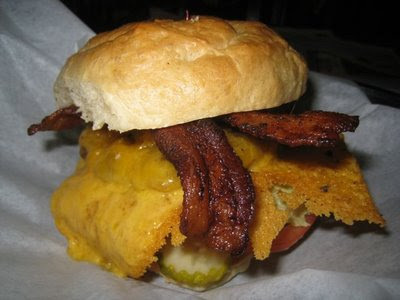 I ordered the Bacon Cheeseburger ($8.50). It comes with fries. Mark had the bleu cheese burger. We also grabbed an order of onion rings ($2.50). The burger was brought to the table sitting on a silver metal flat pan, like a small pizza pan. There was yellow paper between it and the plate. On top, a generous portion of scrumptious looking fries joined the ample burger. The fries tasted even better than they looked. Crisp and medium thin with skins on; they must have been cooked in the freshest oil ever. The burger had a very pillowy, white bun that was fresh and lightly toasted. The lettuce, tomato and red onion were all very cool and crisp. The meat was tasty and cooked just right. The onion rings were battered style, hot, sweet and crisp. We enjoyed the burgers and really enjoyed the fries at Gordos but the atmosphere was just as good. Gordos is a comfortable, neighborly place to share a burger with a good friend. 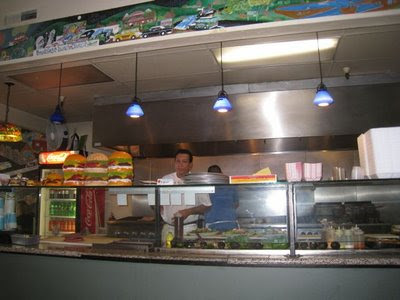 Nations Giant Hamburgers in Livermore is another in the NorCal Nations chain. This store is a little newer than the one I reviewed in Fremont. But like other Nations, the burgers are consistently good. I walked in on a Friday around 1 PM and was greeted warmly by the staff. I ordered at the counter and took my red Naugahyde seat at a booth. When my name was called I retrieved my meal at the counter. 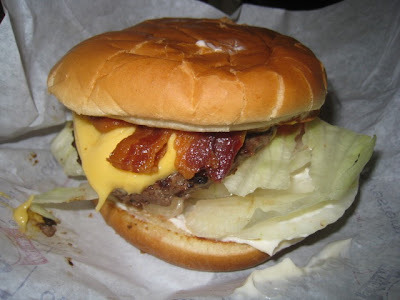 My bacon cheeseburger ($5.70) was nicely wrapped in white Nations paper. Sitting beside were salty medium cut french fries ($1.50). The white bun was toasted and fresh. 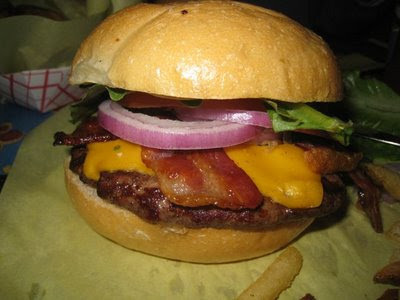 Inside sat a hot fresh patty of beef with melted American cheese and crisp bacon, lots of fresh lettuce, tomato and onion. Mayo generously covered one half of the bun. For $5.70 this place is a consistently good bargain. 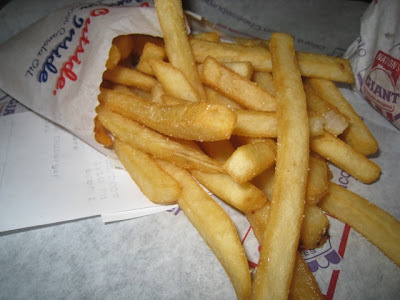 The fries were hot, salty and tasty as well. If a Nations sits nearby, there is no reason to hit one of the big guys for lunch. For the price it is a great, tasty bargain. After a night of martinis at the Ahwahnee Hotel bar, we rose early on Saturday morning and started on our hike. After climbing about 2000 feet and hiking past Vernal and Nevada falls, we camped out in little Yosemite Valley. 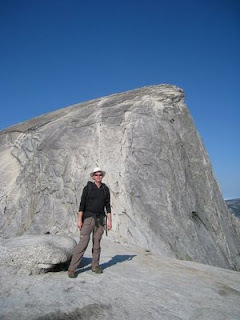 The next morning we headed up the trail to Half Dome reaching “the Cables”. The cables are two parallel cables stretching up the shear side of half dome. It is the only way up unless you are a rock climber and was one of the most exhilarating experiences of my life. The views up top were incredible. 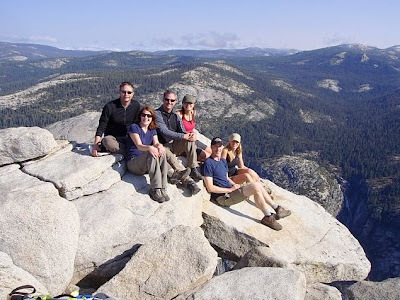 (Photo below: The team perches on top for a photo before descending 8.5 miles for a burger.) At 9:30 AM we began our 8.5-mile descent back to the Valley and our burgers. We stopped for a camper’s lunch and packed up our tents. At 4:30 we made it to Yosemite Lodge and our much anticipated burger rendezvous at the Mountain Room. We were very disappointed to see they didn’t open until 5:30. So we had to make due with beers and guacamole at the bar. Finally we sat down in the Mountain Room and ordered our burgers. All seven of us at dinner ordered the Hamburger. 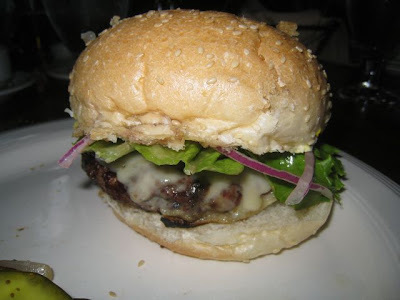 For $15 you get a 1/2-pound locally raised, grass fed beef burger with Gruyere cheese. It sat on a huge white sesame bun that was not toasted and was a bit large for the burger. It came with lettuce, tomato and onion on request. The burger was nicely prepared and had a good charcoal flavor. For the price it was not as spectacular as one would expect, but after a long hike, was devoured by the team. The burger also came with some rather pathetic roasted red potatoes on the side. In the end, the burger was a nice capper to an amazing weekend. If you have never been to Yosemite, you are missing quite a treat. And I am not just talking about the burger.